Russiagate began as a lame excuse for Hillary Clinton’s spectacular failure to defeat her supposedly ideal opponent, a “deplorable” straw man who could easily be knocked down by the supremely “qualified” corporate battle axe. As Wikileaks revealed, Clinton campaign chief John Podesta urged Democrats and cooperative media to make Donald Trump a “Pied Piper ” of Republicans in the belief that a Democratic landslide would result. Corporate media came through for the Democrats, bestowing a total of $5 billion in free air time on the Trump campaign –more than Clinton, Bernie Sanders, Ted Cruz, Paul Ryan and Marco Rubio combined. Thus, the Democrats and Democrat-friendly corporate media gave us the Trump presidency—with decisive help from Black voter suppression by the GOP in Midwestern “swing” states. Simply put, the real rulers of the U.S. empire could not depend on Donald Trump to maintain the momentum of the U.S. military offensive that had begun with Barack Obama’s attack on Libya in 2011 and continued with the jihadist proxy war against Syria, the coup that toppled the elected, Russia-friendly government in Ukraine, and the “pivot” against China. It doesn’t take an algorithm to figure out that the U.S. is rapidly being eclipsed by the rising powers of the east: China and its geopolitical partner, Russia. At this late stage in the imperial game, the only strong cards Washington holds, are military. Hillary Clinton was “all in” with the global military offensive, including a willingness to play “chicken” with Russia in Syria and Ukraine. The fate of empire could not be left in Donald Trump’s erratic little hands, so he was to be hobbled by Russiagate from day one of his presidency. The main objective, however, was not to knock Trump off—which was always a dangerous long shot—but to control him, and to keep the war hysteria going. Thanks to Russiagate, the Democratic Party stepped forward to fill the imperial void that was temporarily created in the corporate duopoly by Trump’s takeover of the GOP. The Democrats became the most aggressive wing of the War Party—as if, for foreign policy purposes, Clinton had not really lost the election, at all. Democrats overwhelmingly supported both of Donald Trump’s record-breaking war budgets—including majorities of the Congressional Black Caucus. Congresswoman Maxine Waters strutted around the Capitol waving an American flag and blabbering about how Vladimir Putin was “continuing to advance into Korea ”—apparently confusing that country with Crimea. Ostensible “Black Lives Matter” activists like Shaun King identified fully with former FBI director Robert Mueller and felt “betrayed” by Trump’s distrust of U.S. intelligence agencies– as if Cointelpro never happened, the FBI isn’t out to frame “Black Identity Extremists,” and the CIA doesn’t tell lies for a living. Having accomplished its purposes, the longest-running of the CIA-FBI’s lies has now become inoperative with Mueller’s admission that there is no evidence of “collusion” between Trump and the Russians. But the corporate media, the Democrats, and most Republicans continue to insist that the Russian government “hacked” the Democratic National Committee emails and gave the contents to Wikileaks for distribution. That was the CIA’s “high confidence” assessment, although the agency’s report clearly stated that it offered no “proof.” But Wikileaks has always insisted that the DNC data was not electronically hacked, but hand-delivered—not by Russians or any other state actor. And Wikileaks, unlike the CIA and the FBI, has never been caught in a lie. Taibbi believes Russiagate has done more damage to U.S. journalism credibility than the lies told to justify the invasion of Iraq. Maybe. But this is not really about the credibility of media corporations; it’s about the legitimacy of the ruling class. The most important function of U.S. corporate media is to fashion narratives that serve the imperial interests of their owners, the ruling class. Ever since Donald Trump smashed his conventional Republican rivals in the primaries and captured half of the governing duopoly, the ruling class has been waging a lop-sided rich man’s civil war, with most of the Lords of Capital bent on making Trump a transitory phenomenon. These behemoths of finance interpreted Trump’s white nationalist victory, on the GOP side, and Bernie Sanders’ phenomenal Democratic challenge to the corporate consensus on austerity as a warning that they had lost control of the narrative—of reality as told to the masses in the exceptional USA. Therefore, in addition to stoking the fires of never-ending war, Russiagate would provide the rationale for a new McCathyism, to justify a purge of dissenting voices from the Internet, the last partially unconquered communications arena. The purge began only two weeks after Trump’s victory at the polls, when the oligarch-owned Washington Post debuted a hit list of 13 leftist web sites deemed “Russian propaganda outlets and sympathizers” by a shadowy outfit called Prop-or-Not . The Post allowed Prop-or-Not’s principals to remain anonymous, ostensibly to safeguard them from harm by the blacklisted left-wingers. But we knew this was a ruling class orchestration—a Jeff Bezos project—and the beginning of a very cold season for the left in the U.S., as the Lords of Capital and their minions struggled to regain their mandate to interpret reality. 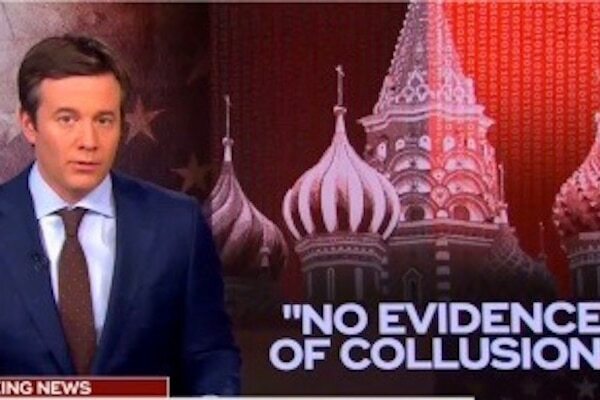 With Mueller’s “no collusion” verdict, Donald Trump can claim to have been vindicated in the Russiagate saga, but there will be no respite for the real left—not to be confused with the phony “resistance” that has run on Kremlin-hate (and Syria hate and Venezuela hate) for the past two years. For the Lords of Capital, taming Trump was just an episode. They see smashing the Left as a necessity, in pursuit of endless wars and austerity.